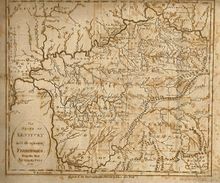 While the region of Tennessee west of the Tennessee River was, on paper, part of Tennessee at its statehood in 1796, it had been recognized as Chickasaw territory by the 1786 Treaty of Hopewell, and it did not come under actual American control until it was obtained in a series of cessions by the Chickasaw in 1818, an acquisition known as the Jackson Purchase, and named for Andrew Jackson, one of the officials involved. The purchase also included the westernmost area of Kentucky as well as a part of northern Mississippi. Although the vast majority of the purchases lie in Tennessee, the term " Jackson Purchase" is used today mostly to refer solely to the Kentuckian portion of the acquisition. This term is also somewhat misleading. Jackson, a military officer at the time, was one of several federal treaty commissioners. He did not personally negotiate the whole land cession, nor was it done in a single treaty. The entire West Tennessee region, especially the area closest to the Mississippi River, lies in a zone of fairly high estimated risk for earthquakes. This area is at the edge of the New Madrid Seismic Zone. In 1811 and 1812, three of the largest quakes in American history hit this region back when it had few European settlers. By some reports, the earthquakes briefly reversed the flow of the Mississippi River. A lasting legacy of the earthquakes is the Reelfoot Lake, a large but shallow body of water in northwestern Tennessee that was created by the earthquakes.